It’s time to wrap it up! As we go into our last full week of IQP we looked back at all the work we have done for the past 6 weeks. We really have come a long way from the beginning of our project and we feel that we have made an impression on campus through educating the public. We were able to get the support from influential faculty, staff and the student body. 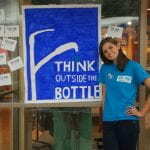 Through our events and surveys we were able to make the community aware of the problems with bottled water, and expose the corrupt advertising of corporate water bottles companies. We have gone a long way from the start and have established the start of a great campaign. But even with all of our progress, work still needs to be done. Through our final week we are still working on gaining information for the campaign and compiling suggestions for the future of this campaign. On Monday we went through suggestions and worked on placing together all of the information needed to make a video displaying our efforts on the project. We also worked on compiling a folder filled with information about our progress and what we hope to see with the future of this campaign. On Tuesday we had an interview with Chris Salter who is works in facilities in order to determine whether it would be feasible to establish hydration stations in new buildings or buildings that are being renovated. We gained lots of insightful feedback and although we couldn’t implement them, we placed all of the ideas into the recommendation document, for future teams and organizations. Wednesday was an off roading adventure back to the water filtration plant in order to get the bottles to place the samples from the bottled water and the tap water at our school. Due to miscommunication on the directions, we went through some roads that were less “roads” and more for lack of a better word, forestry arena. But we made it, got the samples and placed the water samples in the containment free containers and then drove them back to get tested. Thursday was presentation day in the project center, a sort of test run for our final presentations. With the feedback from both our advisor and our co-IQPers we were able to see flaws in our PowerPoint and an already good PowerPoint became even better. Friday was still a work day for us, we had a meeting both with Philip Clay and Joe, from Chartwells. During this meeting we were able to gain insightful feedback on some of the financial aspects and looking specifically at how our campaign can be placed into two categories the business aspect and the educational aspects. Both are important to the school and with these two big ideas the campaign can really more forward. From this experience we not only got great experience for the workings of the real world, but we also learned a lot about ourselves and our team. We are a group of people that started out as strangers who were told “this is your goal” to ban the bottle on campus. Through our experiences we learned to work with different personalities within in the team, allowing peoples best qualities and strengths to reflect through, this shows in our work. Our creative sides were able to be fully explored and we grew not only in our professional experience, but also with people. To say that this was a good experience does not do it justice. This interactive experience is one which should never be passed up. We would like to thank all of the people we have meet and talked to through our IQP experience, it has truly been a unforgettable experience!!!! Time to suit up for the Task Force! This week it was back to business as usual for the team. 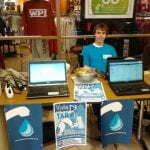 Sending out emails upon emails and preparing for our tap water challenge again for Wednesday. One of the big events on the calendar for this week was giving a presentation for the President’s Task Force on Friday. The Task Force works on getting the big environmental/sustainable changes accomplished here on campus. Gaining their support was the ultimate goal of the week. On Monday we headed to the project center to send out our emails, prepare our presentation and compile all of the data that we obtained from the previous tap water challenge. We then had our bi-weekly meeting with our sponsor Sarah and our adviser Professor Dehner, which went well we came up with great new ideas for advertising out campaign and moving it forward. Tuesday was an on campus day for us. We spoke with the activities office for WPI to discuss the showing a documentary on campus. We also looked into scheduling some of our other events and contacting Chatham University about their financial implications of banning the bottle. Wednesday was another tap water challenge day!!! We table sat down stairs, due to a conflict with the reserved tables, but it ended up working great because it was a change of scene allowing for people who weren’t usually up stairs to take the challenge. Thursday and Friday were all about the presentation. Our main focus those two days was about both creating and presenting the best possible presentation to the President’s Task Force meeting on Friday at 1pm. After two days of practicing our presentation we had a really good presentation and it went smoothly. The reaction from the Task Force was positive, but with slight hesitation. They are willing to support our efforts but aren’t able to fully comply with our goal of eliminating the disposable water bottle on campus. But even small progress it progress and we march forward with our campaign and gaining the support of everyone on campus!!! This week was cut short due to thanksgiving break! Although the week was cut short we were able to accomplish a lot. On Monday we meet with Jill Appel from Concord, MA. She is leading the campaign to ban the bottle for the town of concord, and she came to talk to us about what she has accomplished so far and gave us some advice on what we could do. After our meeting with Jill we discussed some of her ideas and came up with ideas that we could implement on campus. We are really excited about the new ideas and they are sure to help us on our campaign. 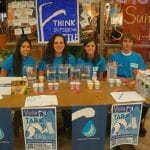 On Tuesday we held our second tap water challenge. We didn’t get the same turnout as last time because students and faculty were starting to head home for the holiday weekend. 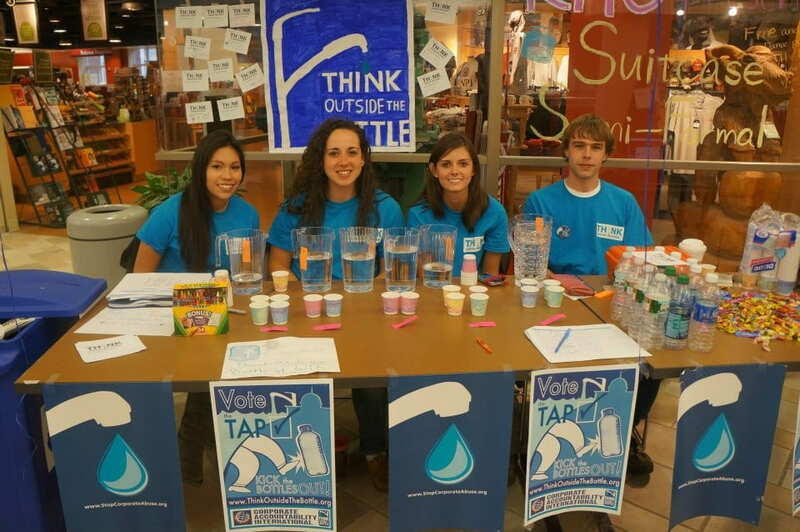 We hope to get a better turnout for our final tap water challenge this week on Wednesday! Warm wishes, water and TURKEY! We had a set back on the water this week. A water main burst in the city and to fix the pipe they had to shut sections of the city off and WPI and the surrounding areas were affected by this. After the situation was fixed the Water Department had a boil order on the water for 2 days. 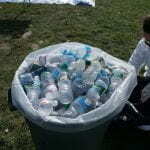 So with that said people either boiled their water or bought tons of water bottles!! Besides that whole situation we had a great week! On Monday we stayed on campus. Mike and Maris did a presentation for the IGSD office to considering students. Ximena and I had a meeting with our contact at CAI and professor Dehner to talk about different options to advertise our campaign on campus without bombarding the campus inbox with emails upon emails. In the afternoon we started to make posters and we contacted Jill Appel from Concord mass and set up a meeting with her about her campaign in the city of Concord MA. On Tuesday we went to the project center. We started looking at different options for advertising our campaign besides making posters. We came up with an idea to make buttons to give out at our events! We posted the pictures of the different designs that we came up with on Facebook and had people vote on their favorite! We meet with Professor Orr, the head of the President’s task force to talk about our project, and his opinions on it. On Wednesday we stayed on campus and went over our findings and discussion chapters. We went over our tap water challenge tests and then for lunch we went to moe’s to support Mike and his chapter of APO. When we came back we worked on our findings and discussion chapter some more and we contacted the green team about the waste audit that we would be participating on thurday. 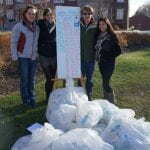 On Thursday we participated in the waste audit for the Green Team . The waste audit is an event where the green team separates trash from 6 buildings. We had a table set up with our posters and we took a count of the water bottles that the audit found in the 6 buildings that they separated the trash from. 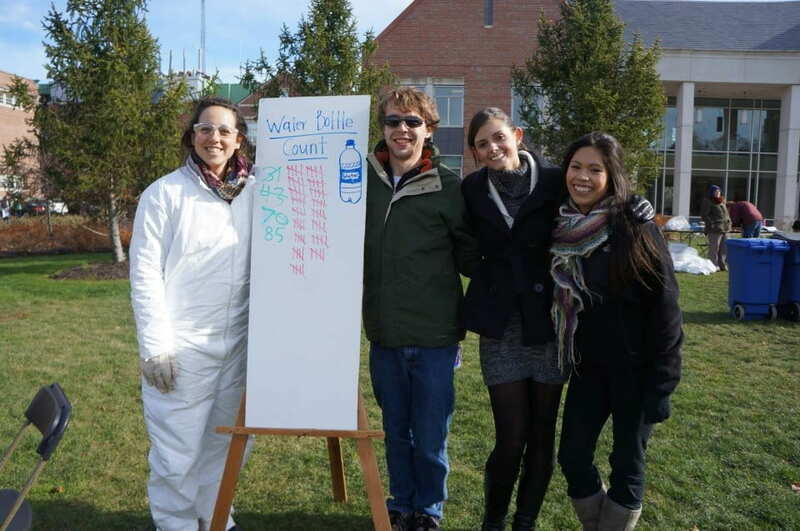 When participating in the waste audit everyone has to wear a gorgeous white full body suit! You can see how much fun we had in the pictures below! On Friday we went to the project center and started to plan our upcoming week. We are looking forward to our second tap water challenge since we couldn’t host one this week due to the water main break in Worcester on Monday. Warm wishes, water and a little bit of trash. This week we sent out our usual mass of emails and prepared for our tap water challenge on Wednesday. 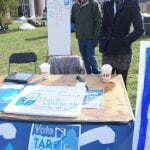 We were really excited for this challenge because this is a great way for the campus to actually taste the difference between tap water and bottled water in an unbiased manner. On Friday we sent out emails on emails and scheduled for the next week. This week was really exciting and we hope to continue our success with the tap water challenge next week! Week 2!!! Take Our Survey Then Some Candy!!! 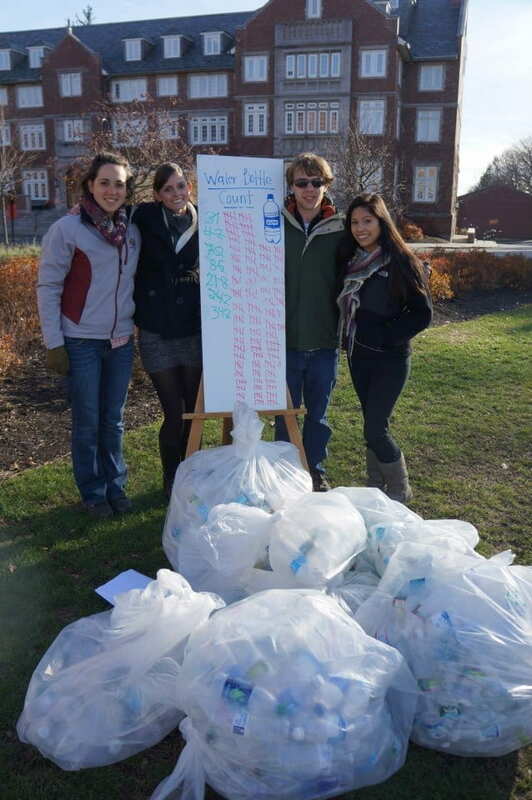 This week’s big focus was handing out our surveys to the Worcester Polytechnic Community. We finished our focus groups on Tuesday with a lot of great feedback from different students. Based on the feedback from the focus groups we compiled a 10 question survey, made up of both multiple choice and open response questions. A poster was designed and distributed to the campus community with information relating to our table sitting efforts and with the location of our table sitting. Tuesday was also a set up day, which meant making sure that everything was ready for the table sitting we were doing on Wednesday through Friday in the campus center. We made sure that we had posters, buttons and balloons provided by Corporate Accountability International. But we felt that to truly become a marketing team we needed SHIRTS. We looked at prices online for shirts that the company had, but as we are college students paying for these shirts out of pocket, we decided to make our own shirts. 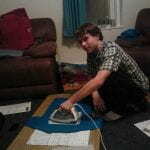 Mike one of our project members embraced his crafting side and took over the important job of ironing on the images to the shirts. We were all very impressed and our shirts came out looking great!!! We also bought candy, because everyone needs incentives to do anything and who doesn’t love candy? On Tuesday night the whole project group came together ( well those who were able to use a car – so 9 people) to have dinner at Peppercorns on Park Ave. We thought that we would be able to get a special deal but as it turns out we did not read the fine print… YOLO right? In the end we all had a great dinner and had fun catching up on the previous week. The DEP team is picking the dinner location for next week!! Wednesday through Friday (Survey, Survey, Survey!! ): the next three days of our week was all about table sitting in the campus center from 10am-2pm for our surveys. We had two balloons and posters set up on the table. We brought our laptops and rented out some laptops, we set them on the table with some chairs and displayed the surveys which were distributed through Google docs. A bowl of candy was placed on the table and a note was placed at the end on the survey telling participants to take a piece, along with the vocal capabilities of the group. 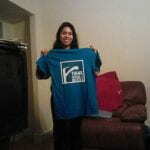 In total about 250 surveys where taken and it was very successful. We hope to send emails to faculty and staff to get a full view of the campus community. On Friday we saw some Pre-K trick-or-treaters walking through campus and looking completely adorable as we were table sitting at the fountain. All the kids were eyeing our candy, but we didn’t have enough candy for all of the kids and their parents or day care employee’s. The picture below is just the beginning of the line, there were about 50 kids all dressed up!! Reflections of week 1Greetings!!! The word of this week was email. Email is something of a running joke at WPI as it is not uncommon to get ten or twenty emails on the walk to class as every organization uses them to contact the campus. Our first week of IQP was dedicated mostly to organization and setting up meetings. Drafts of posters and captions and even emails were constantly being created and emailed to each other and edited and re-emailed and at the end of the day it was something to behold when the day’s email inbox was larger than all of last week’s. Humor aside, the week as a whole was very productive and we like to think that we got a lot done. Tuesday was spent gathering information and reserving locations. We set up an interview with an executive on the WPI green team, who to our good fortune is also a major correspondent with WPI facilities, who we plan to work with closely. We reserved locations to hold our focus groups on campus and talk with members of the campus community to gather opinions on campus. Perhaps most importantly, we made dinner reservations for the project center at Peppercorns for the following Tuesday (okay, maybe not completely aside). In short, there were a lot of emails and phone calls, and we set ourselves up well for the following two weeks. Wednesday was very fun: we toured the Worcester Water Treatment Plant in Holden. Basically, if you turn on any sink, shower, faucet, etc. in the greater Worcester area, it came from this plant. The people there were very excited to give us a tour, and were very knowledgable about their jobs. The tour consisted of a walkthrough of the entire filtration process, basically following the water on its trip through the plant. Darren, the operator giving the tour, cares very deeply about providing the best quality of water possible, and this was evident in his operating of the facility. Everything was very neat and tidy in his office, as well as in the plant in general. Too bad we can’t just bring the entire campus on a tour, it would make our job very easy indeed. Following a Thursday of planning the finer details, today, Friday, consisted of two of our three focus groups. We held them in a conference room in the IGSD, we think the comfortable chairs were a bonus. We made cookies, brownies, and cupcakes for the event, everyone seemed to love them, so we already have one tactic that works. We got a lot of useful information from the exercises, and to our delight, it seems like there are a lot of people on campus that already support this movement. We have also gotten a lot of good ideas from people that we hadn’t thought of previously. Pure speculation at this point, but we will likely take advantage of some of these ideas once we get a chance to pour over notes and analyze them. It’s been a good week so far, and we are definitely looking forward to continuing our focus groups next week. We are also planning to table-sit in the campus center and distribute surveys, hopefully we won’t be wishing we had some of the IGSD chairs.